Bruges is beautiful. A perfectly preserved Gothic style city with the best beer, chocolate and waffles (at least we think). Bruges was the first place we visited on our Christmas holiday. We arrived via Eurostar from London to Brussels then hopped on a train from Brussels to Bruges. Upon arrival in Bruges, we walked around the Christmas market in Market Square. Every year, many main squares in Europe transform into Christmas markets. Local food and drink, Christmas ornaments and crafts are sold everywhere. Some even have ice-skating rinks. Even though fair-style festivals are not really our thing, we visited a number of them during our trip and shared a lot of laughs. We certainly enjoyed the people-watching, hot mulled wine and all the local delicacies. At this particular Christmas market we did not indulge in any food or drink as we wanted to save the calories for some Belgium beer (more on that in a bit). 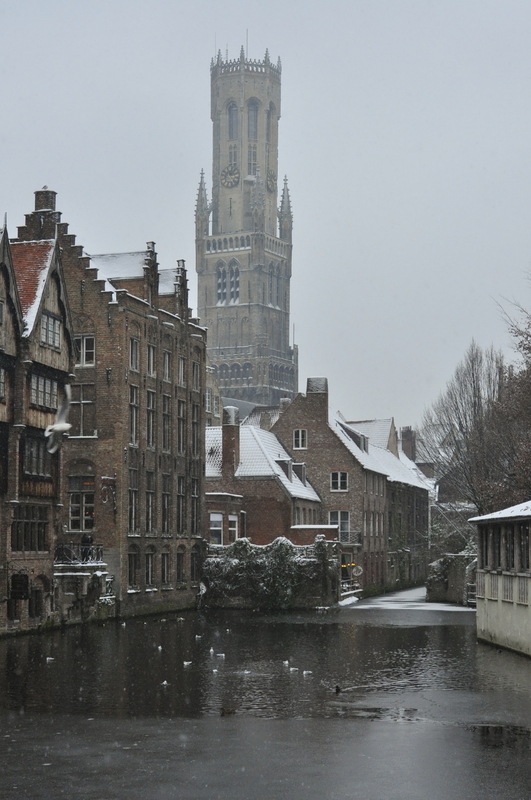 Bruges is one of those cities that you can tell is a “tourist city” and rightly so. It’s wonderful architecture, narrow alleys and weaving canal make it impossible not to like. Being as cold as it was, we were only able to be outside for short periods of time so we did not get to see as much as we would have liked. Bruges is an easy city to navigate by foot and we managed to see parts of the city away from the crowds, even if we did have to plod through snow. To get some heat moving through our bodies, we walked the 350+ steps to the top of the Bell Tower (Belfort) in Market Square—one the most famous landmarks in Bruges. Due to refurbishment, part of the panoramic view at the top was closed so it was not quite the full view of the town as we expected, but we did enjoyed the hypnotic climb up the twisting staircase. We also visited the Groeninge Museum which houses a terrific collection of Flemish art from before the Renaissance to modern art. It was bit overcrowded that day but it was definitely worth the stop. We also paid a visit to the Dumon chocolate shop and purchased a small sample of their guilty pleasures. Creamy, smooth and oh-so delicious. And finally, it wouldn’t be a visit to Belgium without trying a Belgium waffle. Unlike in American, waffles are enjoyed in the afternoon here. The waffles we ate were hands-down the best waffles we ever had—warm and sweetened with brown sugar. Although, I do not remember the name of the café, there are plenty of restaurants and take-away stands to order them from throughout town.